DESCRIPTION Due to the lack of availability and the fact that some of the O.E Rallye & Golf G60 boost hoses are no longer available we have commisioned our own. 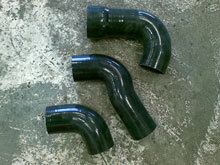 These are manufactured for us by the same silicone hose company that manufactures our Twin Inlet Kit hoses and with whom we have been working closely with for the last 3 years, so we know and trust their quality of workmanship. Manufactured using the best virgin silicone and incorporating a 4 ply re-enforcment (not 3) the spec of which far exceeds the quality and durability of the original rubber items. The hoses are also designed using the same dimensions as the original Golf boost hoses ensuring a perfect fit. Available in two options - Please Choose from the list below.